There is a predecessor to the Atty called the Attention. It’s not a cocktail I would normally write about here—as originally conceived, the Attention is a bad cocktail, one of Hugo Ensslin’s worst ( Recipes for Mixed Drinks , 1917). Equal parts gin, vermouth, absinthe, and violette, it is an undrinkable mishmash of flavors. In the Atty we have a classic gin martini with the signal additions of absinthe and Creme de Violette; together, they present a flavor tension that is hard to describe. In a properly balanced Atty, each sip of the cocktail presents alternating sensations of floral sweetness, herbs, and spices—it isn’t an argument exactly, but more a flavor conversation as the cocktail rolls from the lips to the throat, and each component attempts to return to the fore. Fortunately, with proper absinthe and Creme de Violette available once again, the Atty is back on the active list, and is well worth our attention. Stir all ingredients with ice until very cold; strain into a chilled cocktail stem. Express and garnish with lemon. Since absinthe overpowers other flavors as it warms, keep the Atty small—2 to 3 ounces—so it will stay very cold as you drink it. The Savoy lists the absinthe and violette in dashes (3 dashes each.) A standard barspoon is an eighth of an ounce, which seems to be a pretty good substitute for “3 dashes” in my experience. It’s a good starting point; the real measures will depend on the characteristics your absinthe and violette. I have been making Atty with the white Kübler absinthe. I also experimented with Herbsaint; it works, but seems a little harsh compared to the Kübler. Note 1: I wondered if the reincarnated Creme Yvette is a good source of the violette for Atty. Not so much. For one thing, the drink turns to that lovely Yvette Pink instead of the opalescent blue that was surely part of the original concept. More to the point, Yvette is not a good flavor match for the absinthe. Perhaps it would go with an absinthe other than the Kubler, but I was not able to adjust the mix pleasurably. Note 2: Since I started this article dissing the Attention, I should note that, with time, its formula has evolved into something very much like the Atty. 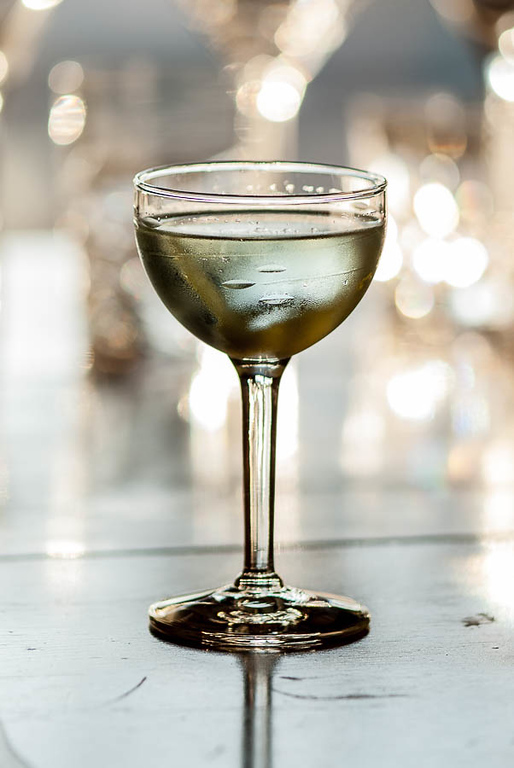 The modern Attention has a 4:1 proportion of gin to vermouth and a dash of orange bitters, along the lines of Jamie Boudreau’s recipe at SpiritsAndCocktails. Note 3: Atty drinkers should probably be aware of the Arsenic and Old Lace Cocktail, which has a resemblance to the Atty, but with the proportions of absinthe and vermouth switched. I still say it’s the vermouth that makes the absinthe and violette a working team; Arsenic and Old Lace pretty much validates that hypothesis. “A Martini with something in it — the astonishing Atty Cocktail” at cold-glass.com : All text and photos Copyright © 2012 Douglas M. Ford. All rights reserved. Looks delish…. except I’m afraid of absinthe….lol…. Double the Rothman Violette, and is perfect… for me anyway. I think the Rothman is an acquired taste. It gets real sweet, real fast for me. Atty must be a delightful color with the extra dose of violette, though.